Please note that Garlik has been discontinued and is no longer available. 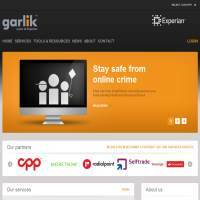 You can read our old review of Garlik below, or check out the rest of the Identity Theft Protection Services we've reviewed. Garlik.com might sound like a digital vampire repellent but it’s actually a low cost solution to preventing identity theft. It does this through keeping you safe from online crime, primarily through two systems: the Garlik Angel and DataPatrol. It is a UK-based ID theft protection service which offers a high quality collection of features intended to improve its users personal and financial security. Garlik (despite its odd name!) is an award winning service, having claimed a number of national accolades. Not only is Garlik the 2008 BT Flagship Award winner, but it has also claimed the Web Based Technology Award, and the 2008 Technology Pioneer Award. GarlikAngel monitors your personal, financial and contact details as you surf the web. This makes it particularly useful for online shopping and banking but it also alerts you if your identity seems to be at risk of identity fraud. It’s essentially an internet security suite, monitoring thousands of sites, social networks and the dark web for any ghouls that might want to drink your blood…or the money your bank account. It is only available from the Chrome Web Store, and only in the US, but at just $2.99 a month it’s a low cost way of protecting your data whilst using the internet if you happen to live in the US. One of Garlik's most impressive features is the built in Royal Mail Redirection registry scanning function. This scans the list of names in the UK that have opted in to mail redirection for the names and details of those users registered with Garlik. This ensures that users have not had their mail redirected without their knowledge (one of the key strategies for the ID thief). With quarterly checks of this record, Garlik users can be sure that this tactic is no longer a concern for them. Users can also register their online banking and online shopping details with Garlik, so that these too are safe against potential fraud. The service also offers a novel feature called QDOS (pronounced 'kudos'). This free service generates a score that is representative of your online persona: your individuality, popularity, activity, and overall imprint on the digital world. Garlik's goal is to make people more aware of their online presence because they realize that such an awareness will encourage many people to protect, manage (and perhaps even cleanse) their digital identity. Feedback from QDOS users will then guide Garlik in the development of a range of new products and services associated with digital identity protection and management. DataPatrol is a similar, but less restrictive way of keeping safe online. You can choose which information is protected and which information you’d like it to search for on websites. This could include your personal information, such as your name or email address, your contact information (home address and telephone numbers, for example) or your financial information. Whilst each of these systems is fine, they’re simply not as intensive as others that are available. The site offers little else to take advantage of, except for a few articles and newsletters. Its blog is severely out of date, which to us suggests that the site isn’t all that well maintained. There are a few free tools though, which might be of interest, although it’s mainly just advice, yet again. As such this site feels a bit like a two-trick-pony, selling mediocre protection at an affordable price, but offering very little else. The fact that its two systems also seem to be US and UK focused is also not going to be all that attractive to anyone who lives in another location (which is to say, most people). Cheap it may be, but if you’re serious about protecting your identity you may need a bigger stake than Garlik.com offers. However, if you are just concerned about some of your information as you do some shopping and browsing online, this might not be a bad option. Please note that Garlik has now been discontinued.